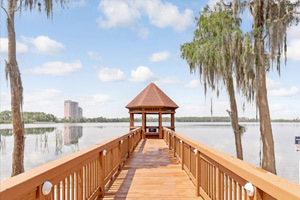 Take a stroll on the lakeside boardwalk and admire the scenery. Quieter than other resorts in the area, get maximum chill time in poolside. Gaze off into the distance from the couch or on the balcony. The spacious kitchen and dining room give you a chance to save on going out to eat. You get complimentary shuttle service to Epcot's Ticket and Transport Center. Grab a refreshing drink while the kids play in the pool. Relax on the balcony and enjoy the cool breeze off the lake. Blue Heron Beach Resort is situated along gorgeous Lake Bryan near the area’s best theme parks. Don’t bother unpacking once you get to your condo, just get changed into swimsuits and get ready to hit both of the outdoor pools. Go for a swim or relax poolside with the latest issue of People magazine and a cocktail from the tiki bar. Little ones will love the kiddie pool – it’s just their size! Take a family stroll along the lakeside boardwalk and admire the views or take advantage of the jet ski, wakeboard, ski boat, kneeboard and tube rentals available through Buena Vista Watersports. Feel like a workout? There are two fitness centers at Blue Heron Beach Resort. Try them both and pick your favorite. Good news! Hawaiian Rumble Mini Golf Course is adjacent to the resort. Stop by the front desk on your way for discount coupons. One- to two-bedroom condos sleep six to eight guests. Fully equipped kitchens have everything you need to make everyone’s favorites. The kids will be begging to help bake your famous chocolate-chip cookies (and make sure the ratio of chocolate chip-to-cookie is correct). And freezers are perfect for storing dessert – popsicles for the kids (and a Ben & Jerry’s stash for the grown-ups). You don’t have to worry about missing this week’s episode of your favorite show, you’ll have Flatscreen TVs with premium cable. DVD players are perfect for a low-key night in for family movie night. Bring favorite movies from home, gather everyone on the couch and ask for a show of hands to decide what to watch first. Show off your multitasking skills and do a load of laundry in your in-suite washer/dryer. Upgrade to a deluxe two-bedroom condo for a second balcony with views of Disney’s fireworks. Shopaholics, rejoice! Blue Heron Beach Resort is just a short drive to Disney Springs (formerly Downtown Disney®). Shops include Alex and Ani, Kate Spade New York and Pandora Jewelry. Get your caffeine fix at one of the two Starbucks locations. Hungry? Rainforest Cafe, House of Blues and Blaze Fast Fire’d Pizza are just a few of your options. Be sure to stop by Sprinkles Cupcakes for dessert. The resort offers a free shuttle to Epcot® and SeaWorld®. Visit the eleven countries in The World Showcase® at Epcot®. Ride Ellen's Energy Adventure®, Frozen Ever After® and The Seas with Nemo & Friends. SeaWorld® features a variety of rides, shows and animal experiences. Kids will love the Flamingo Paddle Boats and Shamu’s Happy Harbor. Fly like a manta ray on Manta. Dolphin Days, Sea Lions Tonite and Ocean Discovery (featuring orca whales) are just a few of the animal shows at SeaWorld®. Animal experiences include penguins and dolphins. Blue Heron Beach Resort offers a shuttle Universal Orlando® (for a fee). Universal Studios® has E.T. Adventure®, The Simpsons Ride®, Shrek 4-D® and Race Through New York® Starring Jimmy Fallon. Universal’s Islands of Adventure® has Jurassic Park River Adventure®, The Incredible Hulk Coaster® and Skull Island: Reign of Kong®. The Wizarding World of Harry Potter® is located in both parks. With a park-to-park ticket, you can board the Hogwarts Express to experience it all. Cancellation and prepayment policies: Cancelations must be made 72 hours before the stay. Cribs (infant beds) are available for USD 3.00 per night. - Guests will be accessed a one-time USD 45.00 housekeeping fee collected upon arrival starting May 1, 2017. This fee is not taxable. Universal shuttle fee is USD 12.00. Shuttles to other theme parks are complimentary.